When mushroom clouds exploded in the sky during Cold War-era nuclear bombs testing, they also created an unexpected boon for science. 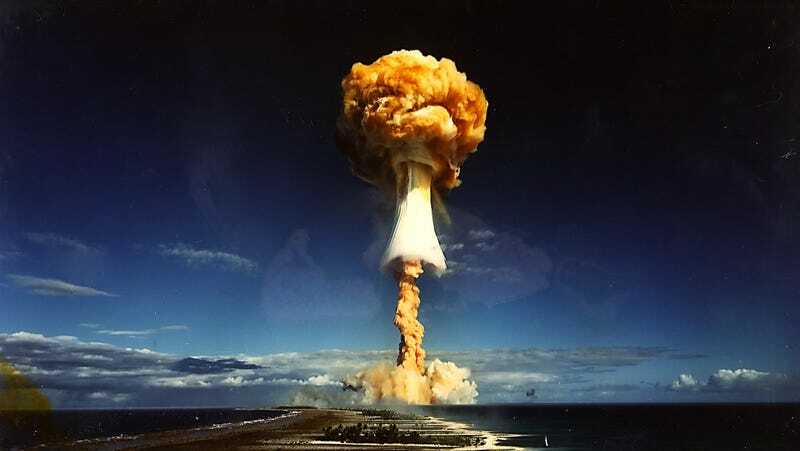 The nuclear explosions caused a massive uptick in Carbon-14 that eventually settled in all living tissue—everything from tree rings to elephant tusks to human brain cells. As such, this spike in Carbon-14 has helped scientists date trees, find ivory poachers, and upend a decades-old dogma that new brain cells cannot be regenerated in the human brain. In fact, Kirsty Spalding and Jonas Frisén, the pioneering brain cell researchers profiled by PBS's NOVA, believe Carbon-14 dating has great potential for shedding light on how quickly cells are replenished in the body. The catch is that the Carbon-14 released before the aboveground nuclear testing ban in 1963 is slowly fading to background levels. There's plenty of research yet to be done—but they only have until 2050. Most aboveground nuclear bomb testing happened between 1955 and 1963, and those detonations released untold numbers of neutrons into the atmosphere. These slammed into nitrogen atoms, causing their nuclei to eject a proton. What was once a seven-proton nitrogen became a six-proton carbon. But unlike most carbon atoms, which have six protons six and neutrons, this radioactive carbon, known as 14C, retained nitrogen's two extra neutrons, a difference in atomic mass that is small, but measurable. Normally, only a tiny fraction of the world's carbon is 14C, so little that scientists measure it in parts per trillion. The bomb pulse doubled this amount. While 14C concentrations are still low even after the bomb pulse, the difference is obvious to scientists who know what they're looking for. The use of Carbon-14 dating in biology was originally forensic. Because skin and hair are continually replenished in a live person, their age—as determined by Carbon-14 dating—is also a proxy for when a person died. Spalding and Frisén used Carbon-14 to help identify victims of the Indian Ocean tsunami, for example, but they were eventually convinced the technique could be used to date populations of cells as well as whole bodies. By looking at the age of cells, they could also figure out how quickly those cells replenished. When they started looking at certain tissues, Spalding and Frisén first found that fat cells were replaced more quickly in the obese than the healthy. When they turned their attention to the brain, they found that some neurons were younger than the individuals they came from, thus showing that the brain can, in fact, regenerate, a discovery indirectly made possible due to the atmospheric effects of nuclear bombs. For more of the background on the neuroscience, read Arnold's piece for NOVA. Photo courtesy of Pierre J/Flickr.